The developmental vulnerabilities of children, along with the legal, ethical, and political pitfalls of encouraging the food industry to target kids, make marketing food to children harmful regardless of nutritional content. In response to the public outcry over the negative impacts of junk food marketing to children, food companies have started using popular media characters to market "healthy" foods to children. These products include fruits and vegetables, as well as processed food. 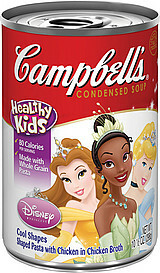 So we now have Campbell's Disney Princess "Healthy Kids" soup, Kellogg's Scooby-Doo! cereal (with less sugar), and others. Researchers and advocates for children's health agree that advertising junk food to children is effective. One 30-second commercial can influence the food preferences of children as young as age two. For young children, branding even trumps taste. Preschool children report that junk food in McDonald's packaging taste better than food in plain wrapping -- even if it's the same food. Similar studies show the same results for food packaging featuring media characters. Research demonstrates that marketing any product to children under age 12 is inherently deceptive. Unlike adults, young children do not have the cognitive capacity to fully understand the purpose of advertising. Very young children cannot even distinguish between a TV program and a commercial. Until the age of about eight, they don't really understand the concept of selling and they tend to believe what they see. Moreover, only 40 percent of 11 and 12 year olds have a full understanding of persuasive intent -- that every aspect of advertising is designed to convince them to do things they might not do otherwise. This makes children especially vulnerable to deception by hyperbole, puffery, and other common advertising techniques. Some advocates argue that deceiving children to eat healthy food is good strategy. But such tactics are actually harmful. A primary goal for advocates should be for children to develop a healthy relationship to food. Foisting character-branded products on children undermines that effort. Marketing to children does more than sell products -- it inculcates habits and behaviors. Marketing branded produce such as Kung-Fu Panda Edamame to children instills the unhealthy habit of choosing food based on marketing cues such as celebrity, rather than on a child's own innate hunger, taste, or good nutrition. Children's health depends on more than diet; their social, emotional and cognitive nourishment are also important. Popular media icons used to sell kids veggies also market myriad other products, including junk food, junk toys and screen media. Research shows that, among other harms, such commercialism inhibits children's creative play -- the foundation of learning, creativity, constructive problem solving, and the capacity to initiate and complete tasks and projects -- which is essential to a truly healthy childhood. And excessive screen time is linked to problems ranging from unhealthy eating, sleep disturbance and poor school performance. Calling for governmental endorsement of marketing "healthy" food to children potentially undermines these legal theories, which we need to preserve as we build a larger movement of advocates to protect children in a more effective and meaningful way. Finally, the food industry is happy to play along when advocates call for the marketing of "healthier" food to children. Corporate lobbyists have invented a voluntary self-regulation scheme to convince politicians and the public they've got it covered with nutrition standards that allegedly protect children. But as many of these same advocates have rightly pointed out again and again, this non-system is a dismal failure. Even the federal government couldn't persuade the food industry to improve its voluntary guidelines. By begging and pleading with the food industry to improve how it markets to children, instead of working to end food marketing to children entirely, we are continuing to endorse a failed system in which industry gets to set the rules, break them whenever it pleases, and then take credit for doing the right thing. The CEO of McDonald's recently claimed with a straight face that his company does not market to children. To bolster his case, he pointed to milk and apple slices in Happy Meals. This is just the sort of twisted logic that results from advocates asking industry to set nutrition standards for food marketing to children. Less sugar in Scooby-Doo cereal and more apple slices in Happy Meals will not make children healthier. Instead of settling for such crumbs, advocates should take a stronger stand to protect children and demand that corporations stop engaging altogether in the unethical practice of marketing to children. Yes, this is a Herculean task and yes, it will take a massive movement to accomplish. Let's get to work. The cost to children is too high if we don't. For more by Susan Linn, click here.